Description: The improved model of exploitation of main-module facilities of measuring technique is offered as a count. Herasymov, S.V. and Kalashnyk, D.M. 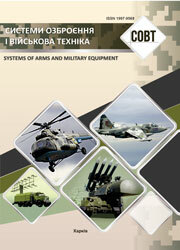 (2007), “Model ekspluatatsii perspektyvnykh zasobiv vymiriuvalnoi tekhniky”, Systems of Arms and Military Equipment, No. 4(12), pp. 66-68.